After playing with it in December, another encounter and a review got me thinking again, about the Canon EOS M5. My impressions and independent reviews seem to confirm, it’s a solid camera, the best Canon M to date. But with few standout features and notable disadvantages, I wonder who the market is for this camera? At the Drink and Click, a couple of weeks ago, Juan brought the Canon EOS M5 for show, on loan from Precision Camera. We talked about its merits. It would make an excellent travel camera, we all agreed. Very true. But so would most of the other mirrorless cameras from Sony, Olympus, Panasonic and Fujifilm. What makes the M5 special? I got a chuckle when I read a recent review from The Verge. The aptly titled, “Canon EOS M5: the best mirrorless camera of four years ago” says it all. I agree with most of their points. On the plus side, Canon’s nice colors and user-friendly user interface. That’s the E5’s strength, along with a very compact body. For Canon users, the option of attaching EF and EF-S DSLR lenses (with an extra adapter) might also be useful, but with dubious benefit. The larger DSLR lenses would overwhelm the small body and grip. I suppose the M5 can make a nice compact primary or a secondary body for landscape photographers, which may be the best way to use the larger DSLR lenses — via tripod. The EOS M5 does smoothly pull focus, via LCD touch screen, for videos. Something it does better than other mirrorless cameras. It might be useful as a vlogging camera or a video camera substitute on family vacations. But really, I find it hard pressed to recommend this camera for most people. It has a small collection of native lenses, so so build and so so design. Beyond the few items mentioned above, all the other mirrorless players have much more capable cameras with sizable lens collections. At the Drink and Click, it attracted very little interest. True, most attendees are photo enthusiasts, so the mirrorless folks are already wedded to their Fuji’s, Olympus’ and Sony’s. They’ve already bought into a new system and don’t seem interested in Canon. Some of the Canon DSLR users don’t really seem interested in mirrorless. Which begs the question, what’s the addressable market for such a camera? In the end, I suppose this camera will either attract Canon fans who insist on a Canon mirrorless or people who don’t know any better and buy it for its name brand recognition. Canon is the largest camera company, after all, so perhaps there’s enough of a market out there. I hope so, for their sake. It could be worse though, we could talk about something even more dismal — Nikon’s mirrorless situation. I was disappointed with the original M. How could such a leading camera company get something so wrong? I loved the design of the body and the lenses, but ouch! the thing was all but unusable. I kept mine, tucked away. A 22mmƒ2.0 pancake lens could always come in handy, and it had a certain charm in some situations. Nothing involving action or bright sunlight, but for landscape work in the shade, not a bad little pocket package. I especially liked the way I could tuck it and the bigger lens away in my little flight manbag. When I saw the M3 with the 18-55 and 55-200mm lenses at a second-hand shop, I had a good look at it. A few millimetres bigger, but with more controls and a tilt-screen. I bought it, and was very impressed with the telephoto lens and the improved autofocus. It’s still slow and fussy, but if I treat it right, it produces excellent images. It’s now my flight camera for when I’m crammed into an economy seat. I can take pictures from inside the cabin, I can put on the telephoto for shots out the window, it won’t take a lot of space or attention. The M5 looks like an advance, with another control dial and an EVF. But at the cost of more size and weight. I’m tempted by the upcoming M6, which promises more performance and 5-axis image stabilisation. But perhaps I’ll wait for a second-hand model. Some of the new M-mount lenses look good, too. For all the ribbing the EOS M series gets, they are capable of great photographs, of course. The earlier models where priced so low, on clearance, that I was tempted for a while, but never bought into it. IQ-wise, the first M was basically a 650D you could fit in your jacket pocket. I loved my 650D. I got some lovely shots with the M. On a Gorillapod tripod at night it worked very well, when I had time to get things just right. Pete, that makes sense. Thanks. I have the M and I’ve had few complaints. It’s my first camera other than a point-and-shoot. So for an aspiring amateur still learning what makes a great shot, I thought this was a great and affordable way to get into photography. I don’t have to make the investment in terms of money and size and weight in order to have a camera that lets me utilize manual settings. I’m looking forward to jumping from the M to the M5 or M6. And looking farther ahead, I like that I have the option of investing in the EF lens lineup just in case I make the jump to a more professional camera. This, Canon’s reputation, and the size, was the primary reason I bought into Canon instead of one of the others. Also, I realize that the AF is slow, especially on the older models. Sure it’s not the best camera out there, but as others have mentioned, if you take the time, you can get some amazing photos. So I don’t mind that much as it forces me to think more about how I set up the shot forcing me to learn more about lighting and other manual controls. Hi Abraham, I’m happy that it is working for you. And if you already have EF-M lenses, it may make sense to upgrade the bodies over time, with more capable models. The EOS M line is fully capable of making professional results. Depending on the subject, there may be no reason to upgrade to a more “pro” camera, which includes DSLRs. The important thing is that you get out there, take pictures and enjoy yourself. Regardless of the camera. Thanks for visiting. There were some great prices around for the M. And yes, as a way to get into more advanced photography, excellent. Fiddling around with settings and changing lenses that were pretty much out of the reach of the average point and shoot. My problem was that I bought it off the net for street photography. Something small and unobtrusive, I thought. Well, yes, that bit worked just fine. But when it took a second or two after I pressed the button to take the shot, well, the moment had passed. My subject would be looking at the fool standing stock still on the pavement, holding a toy camera out at arm’s length. The original M was remarkably slow. So slow that when I first used it, I thought it was broken. There’s been a firmware update that sped up the focusing, somewhat. Compared to the first M, the M5 is so much faster. Unfortunately for Canon, their competition has also sped up considerably too. It is remarkable that both Canon and Nikon did not dedicate enough resources to this technology. It seems as though Canon had released a rushed product that if anything has damaged their reputation further. Canon and Nikon are the biggest players in the DSLR market, I think they were trying to protect their cash cow by not making a worthy mirrorless camera. I remember this thought being raised at the time: that they were producing “crippleware” cameras because real photographers used big full-frame, full-featured, full-expensive DSLRs, and there always had to be an upgrade path. 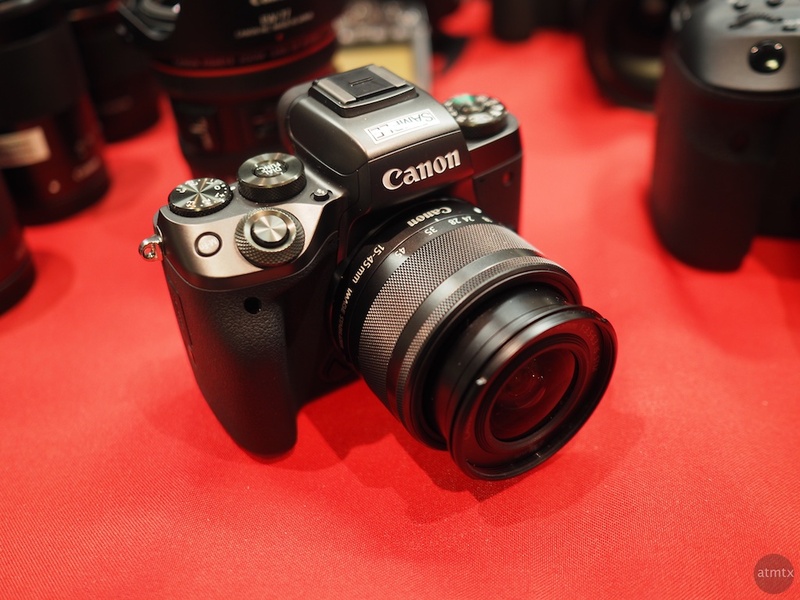 Buy an Eos M and the next purchase will be a 650D and so on. But this was not a strategy pursued by Olympus, Sony, Panasonic and so on. I think they all still produce DSLRs, but their focus (hor, hor) is now on mirrorless. They must be really cleaning up. Nikon, I think, has abandoned the mirrorless market, and Canon is still playing catch up, after a year where it looked like they’d backed out as well. I think Canon and Nikon together captured close to 90% of the market. So Olympus, Sony and Panasonic really didn’t have any future in DSLRs. Mirrorless was their only option, especially after the point and shoot market imploded. Sony and Pentax is the only other people who still make DSLRs. Olympus, Panasonic and Fuji are pure mirrorless now. Yes, sort of like a gentle introduction to a new technology to bridge the gap from DSLRs, I suppose. Hard to know what the strategy is, or if there is in fact a strategy in these big corporations. Those big L-series lenses need a fairly hefty camera. Sure you can attach them to an M-series with the adaptor, but there’s not a lot of grip on these tiny bodies! The Canon guy at Imaging USA pitched it as a (lightweight) travel/vacation camera for a Canon shooter who didn’t want to haul a lot of gear that could also double as a backup or second body when on the job. It makes sense to me for someone who is already invested in Canon glass, less so for others. Possibly. However, those EF and EF-S lenses plus adapter are going to be pretty big on such a small body. Yes, it will work but the experience might be non-optimal. If they had brought this out a couple of years ago instead of the original M, I would have hung onto my Canon lenses and DSLRs. But it was so disappointing, and the Olympus EM5 so very good, there didn’t seem to be much point. Canon is playing catchup in mirrorless land. With EF and EFS glass (and the adaptor) it’s a chunky package. With the native EF-M lenses – and there is a good range now – it’s probably worth buying in its own right as a handy camera for travelling, especially for those happy with the Canon system. Getting to know a new set of menus and way of doing things can be a chore, and another way to lose shots. Agreed. I don’t know if they missed the boat. By they certainly missed my boat. However, in their defense, Canon does have a nice user interface. Simpler than Olympus and the touch controls are better implemented. Oh yes, thoroughly agree. That’s why it was such a wrench for me, to leave a familiar and well-designed way of doing things for Olympus’ complex and sometimes baffling menu system. I loved the purity and clean design of the Eos M, somewhat lost in the more recent models, but it was just such a dog of a camera in everyday use there was no point in persisting. The M3 is much better, and I suspect the M6 will be better yet. The M5, well if they’d brought it out a year previously, maybe. But the Olympus Pen F sits in roughly the same niche, and now that I’ve got that little joy of a camera, the M5 looks awkward and clunky in comparison. Purity and elegance of the menus and controls is all very well, but in the end it’s about the image, not the camera, and Olympus/M43 gets the job done, whereas Canon is still struggling a little in comparison. I owned that original “m” camera too. I also thought it was broken. Eventually, I decided it really WAS broken, at least for me. I couldn’t take a picture. It would focus and unfocus and focus and unfocus and the shot would go away. I put it in a box and gave it to a friend. But then came the PL-1, still one of the most fun cameras I’ve ever used. I’m glad it wasn’t just me thinking that Olympus has a bizarre menu system. Someone should go through that menu system and clean out the junk. Put all the stuff NO ONE uses into one heap and move the things we all need into other places where we can find them. It isn’t hard to do, but they will need a photographer to explain it. Developers don’t get it. For a long time, I owned nothing but Canons, from little point and shoots up to a reasonable DSLR – the 70D. I loved the way Canon approached user interaction. Things just flowed and it was never too much trouble to do stuff. The Eos M was a case in point. Pretty much everything had to be done via the touch screen because there were very few actual controls. Not a problem. Except in bright sunlight, or when you couldn’t see the screen because of the shooting angle, or you had your attention centred on the scene, rather than the camera. Then I went to Olympus and I thought I’d died and gone to menu hell!